Following UFC Nashville, Anthony Pettis calls out the Proper Money Man Conor McGregor to face showtime Pettis at 170, following his flashy Superman Punch KO win over Stephen Thompson. Pettis after his debut Welterweight win becomes the third player to have registered wins in the featherweight, lightweight and welterweight, and guess who's record Pettis just matched? After UFC Fight Night Nashville former Lightweight Champ Showtime Pettis matches Kenny Florian and Conor McGregor's record of three division victories. Following Anthony Pettis' win over Wonderboy, Conor once again tried stealing the limelight by putting another name out there in the media. 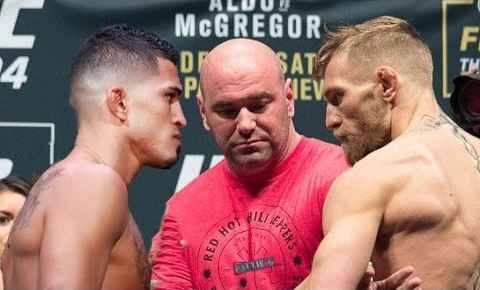 This time McGregor congratulated Pettis via a tweet and showed interest in fighting him after Anthony Pettis on his post-fight interview hinted that he would like to fight the former lightweight champion, Conor McGregor. Publicity Stunt or a real possibility? It's not the first time Conor has called names out, so it's not known if he is really itching for a fight or he is just trying to stay relevant? As a businessman, Conor is doing pretty well with his whiskey brand and at the same time, McGregor has no business getting punched in his face for $20 million or so as he has made a fortune from his past fights. But as per the Irish man, he will never stay away from the fight business as he loves it and embraces the opportunity the fight business has given him. So here is a mild reminder of the fighters that McGregor has openly called out lately. Donald Cerrone, Max Holloway, Khabib Nurmagomedov, British fighter Jorge Masvidal, and good old trilogy fight with Nate Diaz. The list never manifested but one thing that has flourished for Conor is his business, deals, endorsements and fashion line. The Irishman if believed is possibly planning to return to the Octagon this July and Cowboy fight was recently switched off after UFC couldn't agree with Conor fighting in a co-main event.